NEW YORK, Jan. 2008 - A vast collection of historical records, documenting the resettlement in New York of hundreds of thousands of refugees and immigrants over the past 60 years from Holocaust survivors to modern-day survivors of tyrannies around the world, will be transferred from the New York Association for New Americans (NYANA) to the YIVO Institute for Jewish Research. The transfer of nearly 1,000,000 NYANA immigration records covering the years 1949-2007 reaffirms the role of the YIVO Archives as the world's largest collection of materials related to the history and culture of East European Jewry and the American Jewish immigrant experience. The YIVO Institute for Jewish Research, located at the Center for Jewish History at 15 West 16th Street in New York City, presently holds over 23 million documents, including over 385,000 books and periodicals in twelve major languages, as well as photographs, recordings, posters, films, videotapes, and items of ephemera. The preservation of the NYANA files is made possible through a groundbreaking three-year archival project launched by YIVO and funded through a grant from the Milstein Family Jewish Communal Archive Project. Once properly processed and catalogued, the NYANA archives will tell the unique and little known story of how NYANA's successful resettlement and absorption of over half a million Jewish refugees in New York in the years since World War II transformed both the New York Jewish community and the texture of the entire city and nation. YIVO plans to make the NYANA collection, including accounts of the early lives in America of many immigrants who went on to achieve great success, available to historians, researchers and family members. "The NYANA records, which tell the story of the absorption of over 500,000 Jewish immigrants who came to the U.S. during the post World War II period, is of great historical significance," says Carl J. Rheins, YIVO Executive Director. "We are gratified to be in a position to provide these important records a permanent home where they will be available to all. The material in the NYANA files provides a very personal account of the lives of these immigrants and their families in terms of their social, financial, and vocation acclimation to the US." "We at NYANA are happy to transfer those files to YIVO for safeguarding, organization and preservation," said Joseph Lazar, Chief Executive of the Lazar Consulting Group, and the Interim CEO of NYANA. "It is extremely comforting to know that for the first time in many years the NYANA records will be reunited in one place, and will be stored in a way that will ensure their preservation for future generations." NYANA was founded in 1949 to help rescue, resettle and rehabilitate Jewish refugees, Holocaust survivors and displaced persons from World War II. During the 1950's and 1960's, the agency resettled waves of Jews fleeing the Soviet crushing of the Hungarian Revolution in 1956, the Castro Revolution in Cuba starting in 1959 and Jews fleeing official repression and anti-Semitism in Communist countries like Romania, Poland and Czechoslovakia. Beginning in 1972, NYANA began the mass resettlement of Soviet and former-Soviet Jews in New York, a process that has brought over 250,000 refugees to these shores over the past 35 years and positively transformed large sections of Brooklyn and Queens. In addition, NYANA has resettled several thousand Syrian Jews and thousands of non-Jews as well, including Ugandans fleeing the murderous regime of the dictator Idi Amin, Vietnamese boat people fleeing the collapse of South Vietnam, and Cambodians fleeing the genocidal Khmer Rouge regime. NYANA resettled many Tibetans in New York, and today provides resettlement services to a mélange of refugees and immigrants fleeing political repression and economic privation in Africa, Asia, Latin America and Eastern Europe. Throughout all of these changes, NYANA's refugee resettlement program had enabled refugees and immigrants from a dizzying array of cultures and languages to build productive and fulfilling lives in their new land. NYANA's caseworkers have helped immigrant clients to develop a resettlement plan designed to meet their every basic need - from safe, affordable housing, health care access, job training and placement, and language learning. Through crisis intervention and culturally sensitive counseling, NYANA served as a link between the refugee population and the local community, helping its refugee clients to better familiarize themselves with American culture and to connect to a peer community that reflected their own heritage. Many of NYANA's former clients have become prominent in New York in fields like finance, social services and the arts. Among them are architect Daniel Liebskind, born in Poland; artist Vitaly Komar; author Gary Shteyngart; singer/songwriter Regina Spektor; Metropolitan Opera Star Joseph Shalamayev; real estate tycoon Tamir Sapir; financier Feliks Frankel; culture impresario Marina Kovalyov; newspaper publisher Valery Wajnberg; Dr. Susan Levit; Dr. Lev Paukman,; educator Alex Shchegol; Ida Kaminska, the Polish Jewish actress who won an Academy Award for "Shop on Main Street" and who came to the US following the purge of Jews from Polish cultural life; and State Assemblyman Alec Brook-Krasny, the first Russian-Jewish immigrant elected to high political office in New York. The extensive records document how these and countless other refugees and immigrants took their first halting steps in America and began a process of integration into their new land that took some to dizzying heights and many others to comfortable, secure and satisfying lives for themselves and their children. As such, these documents will be invaluable to historians and others interested in better understanding the evolution of American Jewry and overall American society during the decades after World War II. Dr. Rheins further noted, "In an era in which immigration dominates the headlines and the presidential debates, the transfer of 500,000 case files and thousands of documents that constitute a precious record of Jewish immigration to America over the past 60 years will dramatically affect the future teaching of American Immigrant history." Established in 1949 with the mission of resettling Jewish survivors of the Holocaust, NYANA is one of the premier not-for-profit immigrant services organizations in the US. 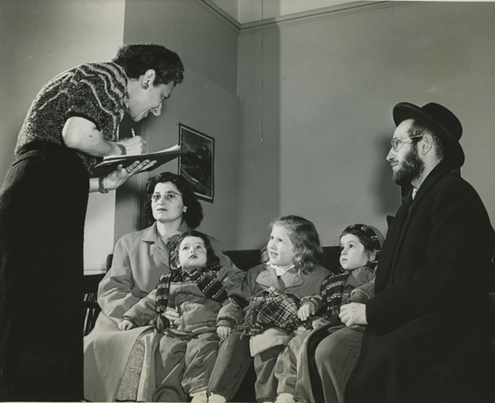 While the agency's commission continues to be the resettlement of Jewish refugees from around the world, NYANA delivers social services to native-born Americans as well as recent arrivals, with the goal of helping its clients to achieve economic self-sufficiency quickly and efficiently. NYANA provides a host of core services to refugees and immigrants, including assistance in finding housing and employment; English language training, citizenship preparation programs; immigration-related legal services; and small business development assistance. The agency also provides its clients with youth development and domestic violence prevention services, mental health counseling and substance abuse treated. For more information, visit the NYANA Web site at www.nyana.org. The YIVO Institute for Jewish Research was founded in 1925 in Vilna (Wilno, Poland; now Vilnius, Lithuania), by key European intellectuals, including Albert Einstein and Sigmund Freud, to record and study the history, language, literature, and culture of the Jews of Eastern Europe. In 1940, YIVO moved its permanent headquarters to New York City, becoming the only pre-Holocaust institution to transfer its mission to the United States from Europe. During World War II, several of YIVO's leading scholars managed to escape from Nazi-occupied Europe and continue their work in the United States. The YIVO Archives holds over 23 million documents, photographs, recordings, posters, films, videotapes, and items of ephemera. These include the world's largest collection of East European Jewish sound recordings; over 200,000 photographs; 400+ videos and films; and 50,000 posters documenting Jewish life from the 1900s to the present. YIVO is headquartered at the Center for Jewish History, 15 West 16th Street, New York, NY 10011-6301, Telephone: 212-246-6080, Web site at www.yivo.org.